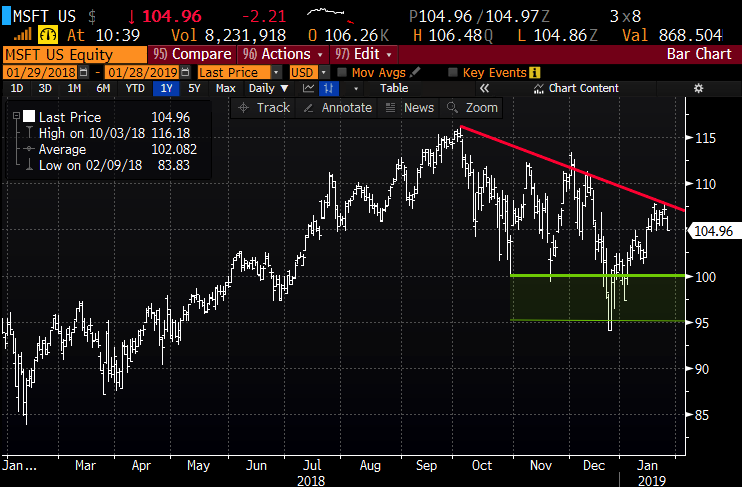 2019 got kicked off with a massive revenue warning by the largest market cap company in the world Apple (AAPL) on January 2nd, specifically citing weakness in China. 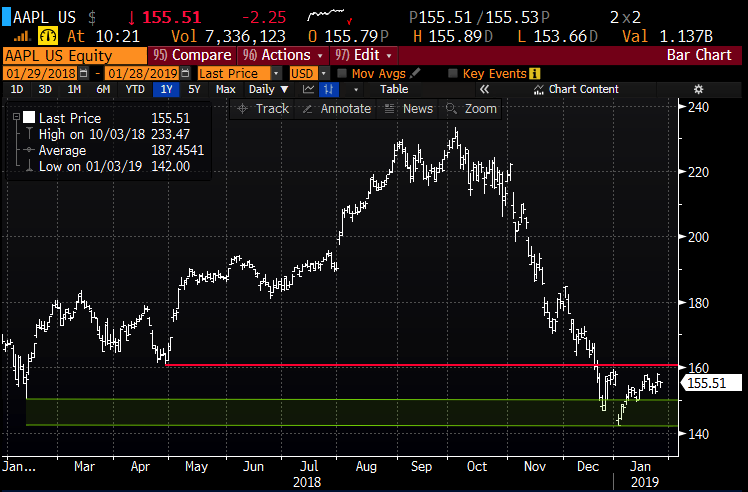 Intel (INTC) who is a customer to AAPL issued disappointing results for the Q4 and guiding the current quarter down, also specifically citing weakness in China. This morning we have a pre-announcement by chip maker Nvidia (NVDA), you guessed it also blaming China. While AAPL’s commentary is clearly a reflection on consumer spending for high-end smartphones, while INTC & NVDA’s results spoke to both consumer demand and enterprise spending. Microsoft (MSFT) will report their fiscal Q1 results Wednesday after the close, and this report, given their 50% revenue exposure outside the U.S., and their history of piracy and IP theft in China and the recent Bing hiccup in the country might put a special emphasis on their commentary in the country. And then we get Amazon (AMZN) on Thursday after the close. The options market is implying about a $110 move this week, or about 6.7% in either direction, which is rich to the average of about 3.75% over the last four quarters, but below its 7% one-day average move over the last 10 years. AMZN is also at the mid-point of its 4-month range since its all-time highs made just above 2000 in early September, down about 21% since, but up about 22% in the last month. I would add that the recent breakout above the downtrend is precarious at best, and if the company were to miss the Q4 revenue guidance that they gave in late October, that was about 6.5% below consensus and were to guide down again for the current quarter, this stock will be back on its way to $1400. Its been my view that the broad market can not rally without a sustained recovery in MAGA, and if we lose stocks like MSFT that have out-performed its MAGA peers and the others are too languish, then the rotations that we see in other sectors in the S&P 500 (SPX) are merely like moving the deck chairs around on the studdering Titanic. The other groups just don’t have the ability to lift the broad market. So what’s the trade? 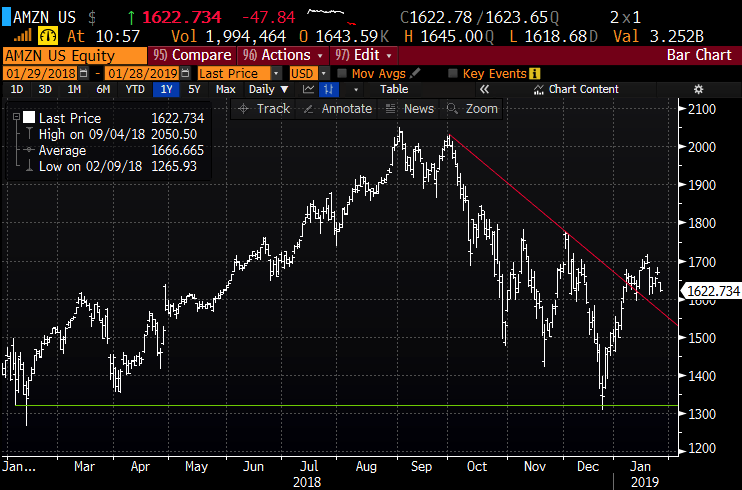 If you are inclined to isolate MAGA earnings (GOOGL expected Feb 4th) and think there is a strong likelihood that disappoints guidance by some or all takes the QQQ back towards the Dec lows, then consider Feb puts or put spreads. Profits of up to 8 between 159 and 151 with max gain of 8 at 151 or lower. 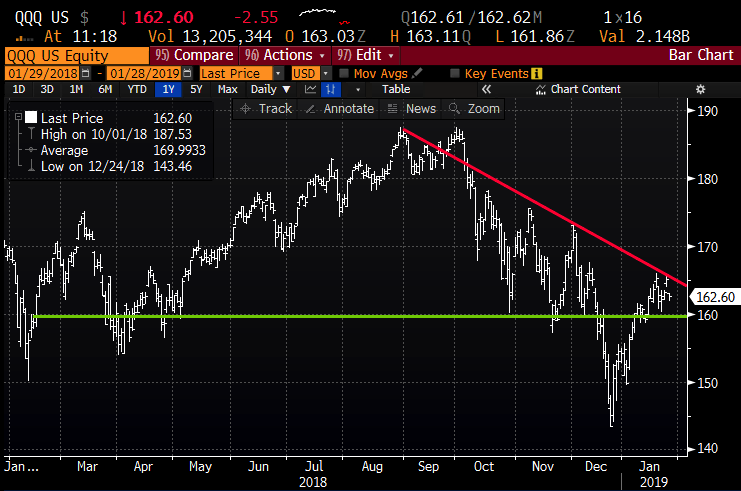 Rationale: this trade idea risks 1.7% of the etf price, breaks even down 2.2% in 14 1/2 trading days and catches the earnings reports of its four largest components that make up 38% of the weight of the index. I would also add that the Friday, Feb 15th is the self-imposed deadline then trump says he will either shut down the government again or take emergency measures to get funding for his wall. This could add a bit of downward volatility to the stock market.